Zoe Jewell, President and Co-Founder of WildTrack, has a B.Sc. in Zoology/Physiology, an M.Sc in Medical Parasitology from the London School of Tropical Medicine and Hygiene (London University) and a veterinary medical degree from Cambridge University. 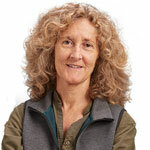 She is a consultant for Animal Consultants International on matters relating to wild animal monitoring and welfare and a member of the Society for Conservation Biology. She has published on wild animal monitoring using non-invasive approaches and animal monitoring ethics. She is currently a Principal Research Associate at the JMP division of the SAS Institute, an adjunct professor at the Dept. of Mechanical and Aerospace Engineering at North Carolina State University, an adjunct associate professor at the Nicholas School of the Environment, Duke University, and an associate academic at the Centre for Compassionate Conservation at the University of Technology in Sydney, Australia.